Pharmacological group: Locally-acting anti-inflammatory and antiseptic agent. Pharmacological operation: Drug has anti inflammatory, bactericidal, expectorant action. Operates on gram-positive and gram-negative microbes. Pharmacological operation of the preparation is defined by complex of biologically active substances: essential oil (80% cineol), tanning matters, organic acids. 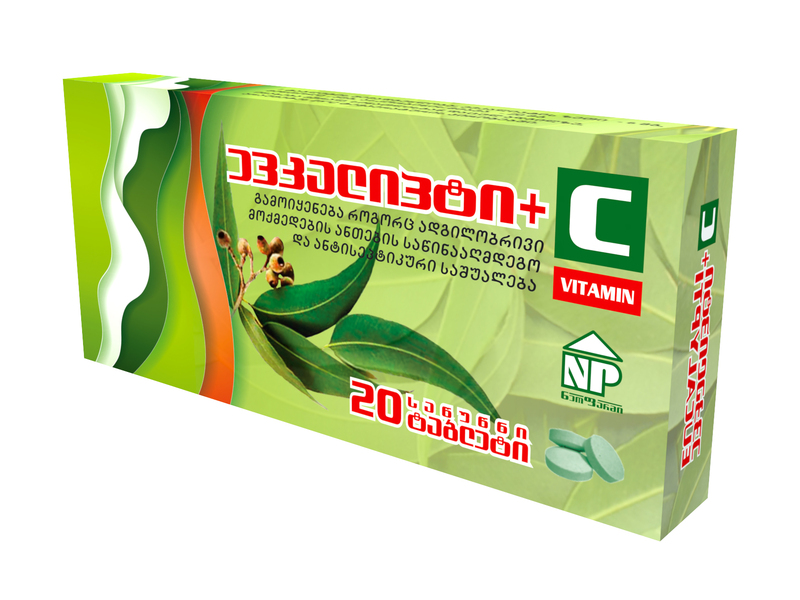 Composition: Active substances: Eucalyptus oil - 6 mg, menthol - 5mg, ascorbic acid -20mg. Aiding substances: Sugar, sorbitol, talcum ,calcium or magnesium stearate; aerosol, green pigment. · Inflammatory diseases of upper air passages (laryngitis, tracheitis, pharyngitis, tonsillitis, bronchitis and etc.). Contra-indication: Individual incompatibility towards the components of the the preparation. Side effects: No data available. Application and dosage rule: For adults: one tablet 3-4 times a day for sucking without chew. For children more than 8 year old: 1 tablet 1-2 times a day for sucking, without chew. Duration of the treatment period shouldn’t exceed 5 day. Overdose: Overdose cases aren’t recorded. Pregnancy and lactation period: Preparation may be used at time of pregnancy and lactation period only with the consent of doctor. Interaction with other drugs: No data available. Influence on driving cars and other vehicles: The preparation does not influence on driving cars and other vehicles. Production form: 10 lozenges on the blister. One or two blisters are put in carton box. Storage conditions: Store in dry, protected from light place, at not more then 25ºC temperature. Order of issue: III group of a pharmaceutical product (issued without prescription). In case of visual defects and expiry of validity date, the preparation can’t be used. Tel/Fax: +995 (032) 259-57-90; 259-64-46.